Since our last newsletter we have covered a lot of miles and been in four countries. On the morning of 2nd December we reorganised Troopie to fit in Wendy, Mal, Jasmine, Liana and Lyndon and their luggage. Yes we did fit everyone in, however there was not much room to spare. In Harare we bought Yellow Card third party insurance for three months to cover Zimbabwe, Zambia, Tanzania, Kenya, Uganda and Ethiopia. Wendy and Mal wanted to see Victoria Falls so we left Backpackers and Overlanders camp near Harare airport on a cool overcast and drizzling morning. We called into Westgate shopping centre and were very amazed to find such a trendy upmarket shopping centre - one could hardly believe that this was Africa. After a spending spree on pies, doughnuts, garlic bread and two loaves of bread we headed for Bulawayo. Interesting to note that we have been able to buy good bread and pies everywhere we've been. We arrived in Bulawayo just as it began to pour rain. This is the first time we've had to set up our tarp on the side of the vehicle. It worked really well and of course the rain stopped just as we were going to bed. The next morning we set off for Hwange NP, Zimbabwe's most popular game park. Wendy, Mal and family were excited to see their first Giraffe, Kudu, Hippo and Elephants. We spent two nights in Hwange NP and then went to Victoria Falls. At Victoria Falls we sent Wendy and Mal off to view the Falls whilst we did a few errands around town and caught up on our E-mail. From here we crossed the Zambezi River into Zambia. On leaving Zimbabwe we were told that as of 1-Dec-98 Australians (and many other nationalities) now need a Visa which costs US$30 each - a money raising exercise. Our Yellow Card Insurance was money well spent and the border crossing into Zambia was smooth going and cordial. We did not need to use our Carnet, instead we were given a temporary import permit which was free of charge. At our first of many Police road blocks through Zambia, a suave “Eddie Murphy” looking official asked us if we had any breakfast to offer him and his pals to which we replied that we had eaten all our breakfast and we had none left. He very good-humouredly laughed it off and waved us on. This was to be the first of many attempts where officials have asked us for a bribe. Time will tell if we get through Africa without giving a bribe. We camped at Eureka Camp grounds just outside Lusaka, the capital of Zambia. This is a lovely campsite owned by an Aussie with Zebras grazing in the grounds. Everyone told us to beware of downtown Lusaka but we had to travel through the centre enroute to Malawi. We did stop in Lusaka to refill our Gas cylinder which cost us US$1, the cheapest we've paid. The road from Lusaka to Malawi is good in a few places but for most of the distance the road is full of potholes. It is unfortunate that third world countries have very limited resources to maintain what was once a good road, possibly put in with overseas aid. These roads are now beyond repair. In Lusaka we heard from Paul and Rachelle, an Australian couple, that we now need visas for Tanzania. When we left Lusaka we thought it would be possible to get the visa in Malawi, however we realised three hours drive out from Lusaka that there was no Tanzanian Embassy in Malawi. Undecided as to what we should do we continued to the next town to phone the embassy which turned out to be another 150km further on. With difficulty we got through to the Tanzanian Embassy in Lusaka and they told us it was possible to get a Visa at the Zambian/Tanzanian border but not the Malawi/Tanzanian border we planned to cross. By this time we were almost in Malawi so we decided to take our chances and continue as we had planned. We had hoped to visit South Luangwa NP in eastern Zambia, however we were running short of time as we needed to be in Dar Es Salaam, Tanzania on the 17-December to pick up Dave Young, a friend from Kalgoorlie, and formerly Alice Springs. The border crossing into Malawi was straight forward as has been the case with all border crossings. We had to purchase Third Party Insurance which cost A$28 (Malawi was not included in the Yellow Card Insurance we purchased in Harare) and a vehicle permit of A$7. We continued onto Lilongwe, the capital of Malawi and stayed at the exclusive Golf Club campground which was the most expensive campground to date (A$21). The campground was double fenced with two security guards on duty 24 hours. When we went to bed we left our shoes at the foot of our rooftop tent thinking this place to be the most secure of all places. This was the first time we left anything unsecured outside the vehicle. In the middle of the night the guards awoke us as they were shouting and chasing after a thief. We lost our three pairs of shoes and two other campers also lost their shoes. The next morning we had to go the police station to make a statement. The Golf Club said that this was the first theft in 15 years and that a new security firm had started only a week earlier. The Golf Club did refund our camp fees. I'm not convinced that this is their first theft however it taught us a lesson to never let down our guard no matter how secure it might seem. We've tried to buy new sandals but have not been able to find any till now so we are each wearing a pink pair of $1 Bata thongs. In Lilongwe we read our E-mail and did some grocery shopping to feed the eight of us. After two nights in Lilongwe we continued East to the Livingstonia Steps campsite at Senga Bay on Lake Malawi. What a magnificent place. There were waves on the fresh water lakeshore with a beautiful sandy beach. It felt like being on a deserted pacific island. We stayed a couple of nights and did very little which was needed after the long drive since leaving Harare. We met up with a couple of South African's who were driving up to Kenya, a German couple who are touring East and Southern Africa and would like to buy Troopie when we get to Europe. The Austrian couple, Gunther and Uli, whose vehicle was invaded by baboons in Mana Pools, were also camping here. They mentioned to us that when they got their Ethiopian visa in Harare the embassy had said that the border with Eritrea had reopened for tourists which opens up an easier path to the Middle East. They are on a similar timetable to us and so we plan to meet up again in Ethiopia and perhaps travel together through Ethiopia and Eritrea, or Djibouti if need be. It was difficult to draw ourselves away from Senga Bay but we eventually had to move on to Nhakata Bay further north on Lake Malawi. The road was bitumen all the way however there were some badly potholed sections. We were pleased that we spent the extra time in Senga Bay. Nhakata Bay was pleasant but a real letdown after Senga Bay. 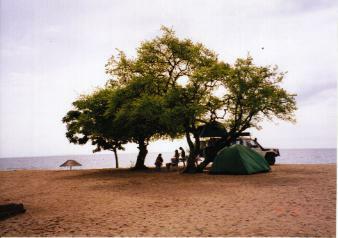 We camped at the Chikale Beach Resort. They were not really geared to accommodate campers. We continued onto Livingstonia which was another of those British mountain retreats away from the heat and malaria - much like Cameron Highlands in Malaysia. The 12km steep gravel track winds its way up the mountain through a series of twenty hairpin bends. The Livingstonia Mission buildings are in a state of disrepair which is unfortunate. We walked around and under two large waterfalls which we really enjoyed, especially the children. We also met two British couples who quit their jobs in Europe and have just started a campsite and permaculture garden. Their plot of land has a million-dollar view overlooking the waterfall, mountains and Lake Malawi. The showers and toilets were really uniquely designed. From here we headed to the Tanzanian border. It was with much trepidation as we approached the immigration officer. To our relief he looked at our passports and said that we needed to fill in a visa application form and pay US$20 per passport. Why the Tanzanian Embassy in Lusaka had said that this was not possible is anyone's guess! As usual the border proceedings were cordial, straightforward and took less than one hour. This was the first time we had to show our Yellow Fever certificate. Road tax was US$25 and the Yellow Card Insurance we purchased in Harare was accepted without question. The road to Mbeya was very good. The countryside along the way was mountainous, green and looked beautiful. 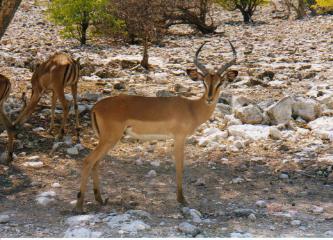 We bush camped just outside Mbeya and next day travelled to Kisolanza Farm Camp, 50km short of Iringa. This farm is owned and run by a British Couple and has been in the family for three generations. The farmhouse is a spacious stone house with thatched roof and a beautiful cottage garden. The campsite is well laid out with immaculate facilities. There is even a separate designated camping area for the overland trucks! We purchased fresh farm vegetables, meat and bread from the farmhouse. From here it took a long day to reach Dar Es Salaam. This city is in poor condition and has little to offer, except for this beaut Internet Cafe. Last night at 10pm we picked up Dave Young from the airport. We have spent the last couple of nights at the Silver Sands Beach Resort(hovel) Campsite with six overland trucks. The whole city has a shortage of water and electricity so parts of the town including hotels have no utilities for some hours each day. Just now as we are typing up this E-mail we met two Aussies, Luke and Mark, who purchased a Toyota Hilux in South Africa and are driving through to Kenya. We hope to spend some time travelling together in Uganda early in the new year. Tomorrow we look forward to spending a few nights in Zanzibar, an island well known for its spice and Muslim culture. We have now spent 84 days camping in our rooftop tent. The time in Zanzibar will be our first time away from Troopie. We have all been keeping well. We look forward to enjoying the plum pudding and custard which we have been keeping for Christmas. We wish you all a very happy and blessed Christmas and new year.